The post-tropical cyclone that was once Hurricane Irene tore a destructive path through Quebec and the Maritimes, leaving tens of thousands in darkness as police continued the search for a driver whose car was caught in raging flood waters northeast of Montreal. The post-tropical cyclone that was once Hurricane Irene tore a destructive path through Quebec and the Maritimes, leaving tens of thousands in darkness as police continued the search for a driver whose car was caught in raging flood waters north of Montreal. The Sûreté du Québec was searching the Yamaska River for a man who was in his vehicle when it was swept away following the collapse of a culvert. Neither the motorist nor his car has been found, but two others escaped the collapse, which left a 30-metre-long hole about 100 kilometres northeast of Montreal. Quebec police were also looking for an 81-year-old man who vanished Sunday after going for a walk near his cottage in Shawinigan, just as the remnants of the powerful storm were moving north towards Canada from the U.S.
Irene churned further northeast Monday to blast Atlantic Canada, after smacking southern Quebec on Sunday with heavy rain and howling winds. About 125 millimetres of rain fell on the province. Roads were flooded, trees snapped and power lines downed. All in all, though, Canada appeared to emerge relatively unscathed from the remnants of the powerful hurricane that killed at least 40 people in the U.S. and left millions of Americans without power. Visit the U.S. National Hurricane Center or the Canadian Hurricane Centre for the latest weather warnings and watches. As it churned to the northeast toward Labrador, many of the wind warnings that were in place for Nova Scotia and New Brunswick were dropped. Wind warnings for Prince Edward Island and portions of Quebec remained in place, with gusts of 90 km/h. Some rainfall warnings remained for Quebec. "Heavy seas, pounding surf and higher than normal water levels are expected along the Fundy coast of New Brunswick near noon today," the Canadian Hurricane Centre said early Monday. 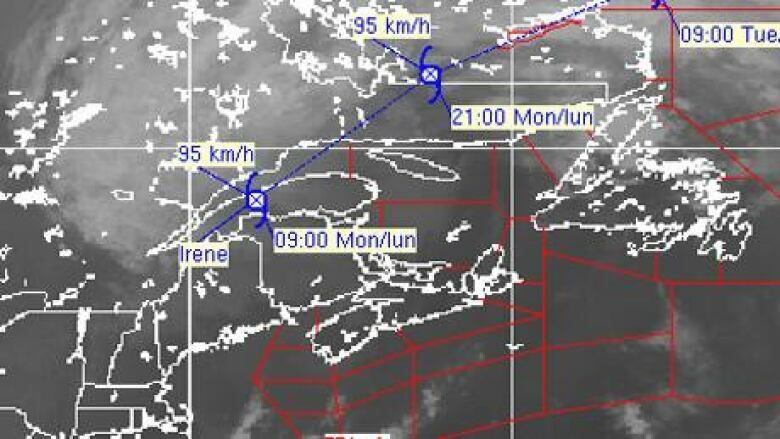 Elevated water levels and heavy surf were also expected for the northeastern Gulf of St. Lawrence Monday night. 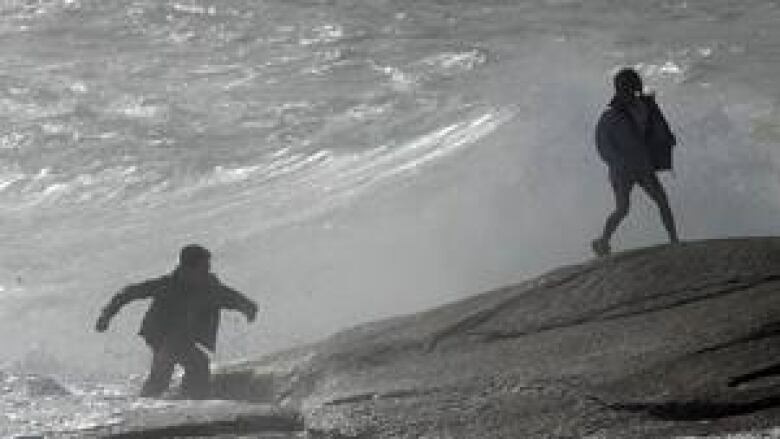 Sarah Konsmo, reporting for CBC News from Saint John, said that although the worst of the storm was now over, winds were still strong and swells near the coast were upwards of six metres high. More than 30 trees were knocked down overnight and officials had to block off a washed-out road after water surged over the breakwater. "Officials are also very much in cleanup mode today," she said, adding that a power line crashed through a car window and "even a boat was sent off its moorings, downriver." As Irene loses strength, the tail end of its attack will hit Labrador. Areas between Labrador City and Churchill Falls will pick up about 40 millimetres of rain by Tuesday morning, with wind gusts as high as 60 km/h. Wind warnings have ended for the Maritimes, but were still in effect for parts of the Gaspé Peninsula and along the northeast Gulf of St. Lawrence Monday evening. The rainfall warnings for Quebec were also lifted. Ryan Snoddon, a CBC meteorologist based in St. John's, said the remnants of Irene will make for unusually humid weather in much of Newfoundland. "Those gusty southwest winds will also be pumping in very warm and sticky temperatures [with] humidex values into the 30s," Snoddon said. "Thanks to Irene, the forecast high in St. John's is 27 degrees. That would be the warmest temperature the city has seen all summer long." Irene's impact began to be felt by early afternoon on Sunday in south and eastern Quebec, where winds and blowing rain knocked out power. At one point Sunday night, about 250,000 homes were without power in Quebec. As of Monday morning, about 215,000 homes had no power. Most of the outages were in the Montreal area, according to Hydro-Québec, as Irene's outer bands lashed at the area and hovered over New England. Trees whipped by heavy rain and wind fell to a thud in Montreal and traffic signals were malfunctioning. Police were forced to close a section of a downtown street after gusts blew away two windows from the seventh and 19th floors of a building. Nobody was injured. Nearly 50 millimetres of rain had already fallen in parts of southern New Brunswick by late afternoon on Sunday and the wind and rain continued through the evening. But apart from tree branches downing power lines, the province seemed to have escaped major damage from the post-tropical storm. At one point, NB Power workers were dealing with 54,000 customers without service. Heather Maclean, who speaks for the utility, said it could be days before service is fully restored for all customers. Rain in advance of the storm caused flash flooding in Oromocto that surged water into 42 basements and as much as 89 millimetres of rain fell on Doaktown in central New Brunswick. The hardest-hit area was around Fredericton, where more than 13,000 customers were without power. Trees heavy with leaves created a sail effect, blowing branches and whole trees onto power lines. MacLean said 80 crews were out dealing with 371 incidents across the province Monday morning. 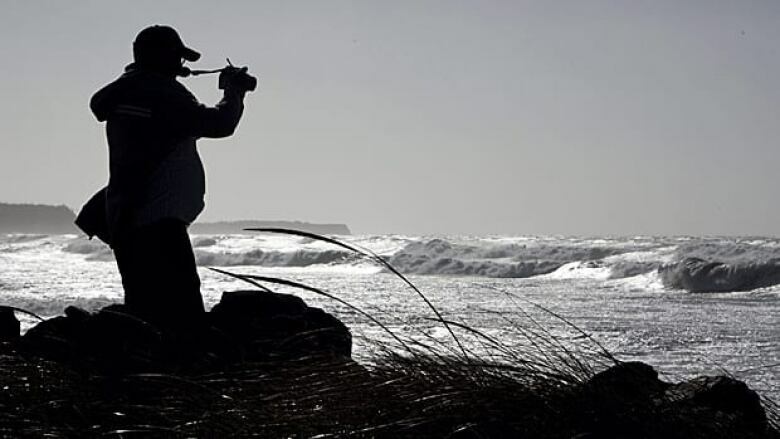 Share your photos, videos and stories of Hurricane Irene. In the northern part of the province, crews were still checking to see if winds have died down enough to start repair work. Andy Morton of the New Brunswick Emergency Measures Organization said the last major threat could come with high tide around noon local time and a possible storm surge. "We are sort of counting ourselves lucky that we did not get as heavy a rainfall as was anticipated. It seems that rain went further west of us and mainly into Quebec," Morton said. "So we are optimistic that we will not have any major flooding." Irene didn't soak Nova Scotia like it did New Brunswick, but it did bring high winds. About 17,000 customers were without power Monday morning. The outages stretched from Yarmouth in the southwest to Sydney in Cape Breton. Two sailings across the Bay of Fundy were cancelled Monday, as was ferry service to Newfoundland. High winds Monday morning were also causing some disruptions getting to and from P.E.I. Restrictions are in place on the Confederation Bridge, which means that trucks, tractor-trailers, RVs, buses, cars towing trailers and motorcycles are not allowed on the bridge. Ferry services between Wood Islands, P.E.I., and Caribou, N.S., may also be affected by the wind. The storm, which began as a hurricane and was later reduced to a tropical storm and then downgraded again to a post-tropical cyclone, delivered enough rain to cause flooding in Lower Manhattan on Sunday. In the U.S., millions of people along the Eastern Seaboard were without power Sunday as the storm pounded New York. Hydro-Québec has sent 54 emergency teams to New Hampshire to help Irene relief efforts south of the border. P.O.V. : Was media coverage of Irene over-hyped?